Written by alex matthews on Wednesday, June 29th, 2016 at 11:04am. The masked virtuoso guitarist known as Buckethead brought his unique brand of live performance to the Music Box in Little Italy on June 21. Wearing all black clothing with an emotionless white mask covering his face and a plain white fast-food-style bucket on his head, the insanely talented musician tore through a 90-minute set of intense solo guitar featuring a wide variety of genres and musical techniques. Unfortunately arriving over a half hour late, the tall disguised performer still took the stage to huge applause, with an impressive number of devoted fans filling the club, many of them wearing masks and buckets to show their support. Known for a nearly endless supply of unique guitar playing, Buckethead has released over 250 solo studio albums. He’s also played on over 50 recordings for other artists including Bootsy Collins, Serj Tankian, Primus, and briefly with a reformed version of Guns N’ Roses in the early 2000s, writing and performing several tracks on the 2008 studio album Chinese Democracy. Covering a diverse array of genres like metal, bluegrass, progressive rock, funk, jazz, and ambient guitar, the musician is a rhythmic chameleon who always manages to infuse a unique brand of guitar technique into his work. For this live performance, Buckethead performed solo, backed by only a recorded track of drums and bass. However, he managed to play a blistering set of guitar material using this seemingly simple setup as a successful framework. The songs were a familiar mix to anyone who has followed his recent career. Highlights included the Guitar Hero II favorite “Jordan” with crazy killswitch technique, as well as closer “Nottingham Lace” from the 2005 Buckethead & Friends album Enter The Chicken. 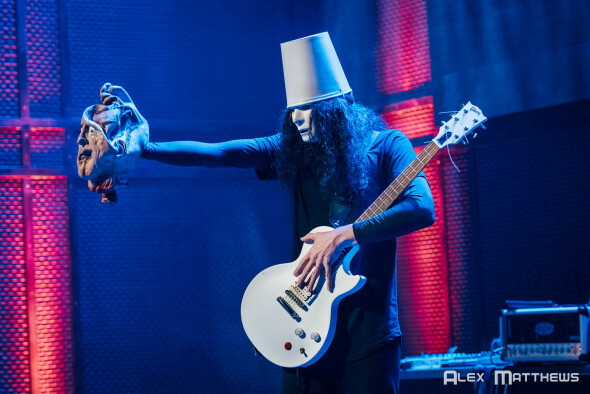 Punctuated by a few brief breaks to show off some signature martial arts nunchuck action or to hand out toys to the crowd, Buckethead kept to the music and delighted the San Diego fans.